What is Adapt Sound feature in Samsung Galaxy S4 (GT-I9500) ? 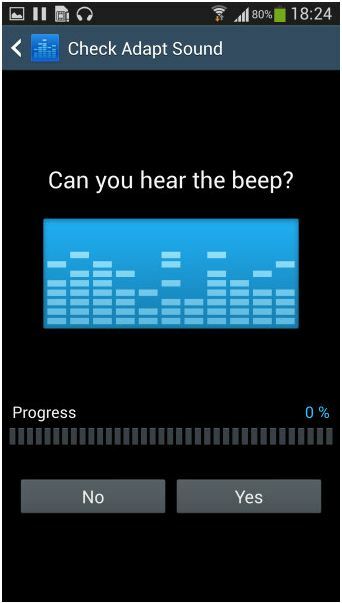 Adapt Sound feature is a very unique feature of Samsung Galaxy S4 (GT-I9500) . This feature helps in automatically adjusting the volume of your device. ● With the help of this feature you can hear everything with the right balance and perfect volume customized for you. ● The Samsung Galaxy S4 dials music up and down and balances left and right audio based on your hearing, the sound source and your preferences. ● It plays a series of beeps (both high and low frequency) and asks if you can hear them. This way the phone can map the capacities of your specific headset and fine-tune its output for optimal sonic experience.